What are the Benefits of Putting My Child in a Montessori School? Home / Blog / What are the Benefits of Putting My Child in a Montessori School? A Montessori education helps children develop their potential in an engaging environment. Here they learn to be responsible, respectful, and competent — but all at their pace. What sets a Montessori education apart from the rest is the uniqueness of the environment. It is not like a traditional school, and it accommodates the creativity and growing minds of our young children. As a parent of a youngster looking for preschools or a new schooling style, only you know what is best for your child. If you have not examined the potential of a Montessori school, now is the time to consider the Montessori Method and what comes along with it. The Montessori approach to education was developed by Dr. Maria Montessori, an Italian educator. She created her educational approach after observing children and how they learn on their own. She found that children did not need encouragement to do certain tasks on their own, and she created a refined approach to education as she studied the children of various countries, including Spain and India. Today there are thousands of Montessori programs nationwide. They range from pre-primary to elementary age, and they offer an effective process for learning that taps a child’s inner potential and creativity. Every child is unique, and Montessori educators understand that. They focus on how a child learns, and they accommodate their unique learning style. Students learn at a pace that works best for them, and they advance as they are ready — instead of being forced to conform to a core curriculum. A teacher does not run the class; instead, it is the students. They engage in the activities they want, and they are encouraged to share and work together rather than individually. Children then learn how to respect the use of a community, and build upon it for inner strength and education. A unique aspect of this type of learning environment is that your child will learn how to critically examine their work, correct errors, and learn from those mistakes as they mature in the Montessori program. The opportunity to learn at their pace improves their sense of freedom. Children are active participants in deciding how they want to learn and that drives internal satisfaction, which increases their confidence in learning. Your child will crave knowledge. He or she will use the tools and freedom inside the classroom to find answers to pressing questions and discover new experiments, solutions, and ideas. Children who go through a Montessori school often have better self-discipline and understand the ground rules of a classroom environment. They refine concentration, self-control, and even their internal motivations. The biggest development with Montessori education is how a child is inspired to be more creative. Children work on the tasks for the joy of doing so, rather than creating a result. When they are excited to do something, they are more creative with how they complete it. Certain skills, such as math and reading, tend to be better in Montessori students than traditional public schools, according to Education.com. Hands-on learning is how the human brain naturally retains information. Therefore, when a student goes through the Montessori program, they will focus on the concrete rather than abstract theories. 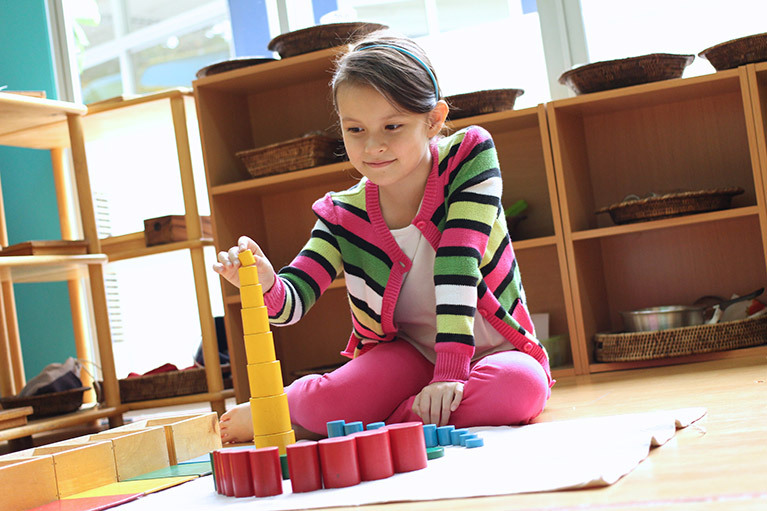 Self-regulation of coordination, order, and concentration occur during Montessori learning. Your child learns how to create their daily routine, educate themselves, and think about what they are learning. If you are switching from a traditional learning environment to a Montessori one, you will need to help your child transition. First, speak with the school’s director for guidance. They often have experience with transitions and can guide you as to how your child will slowly move into the Montessori lifestyle. You will want your child familiar with the school, so take him or her with you when you tour it and meet with the teachers. Visit several times so that your child is as comfortable as possible. When your child is comfortable in their new environment, they are more apt to learn and seek things out in the classroom. Make sure your child is getting enough sleep at night, and that they eat a hearty breakfast in the morning. Younger children tire quickly, especially in a pre-school setting. To get the most out of their new education, it is best that they are well-rested so that they are patient and ready to learn. At home, promote more independence in your child’s tasks and self-care routines. That means allowing your child to manage to get in and out of the clothes they wear, teaching them how and letting them use the restroom on their own, and letting them lead with their personal schedule. The more independence you promote at home, the better they will perform in the Montessori environment. Contact Primary Montessori today to learn how to get your child started with the Montessori method.